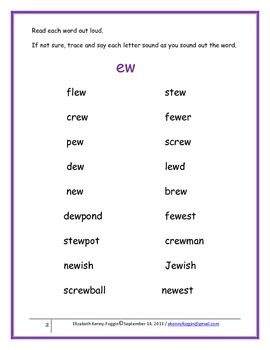 Phonograms: A Multisensory Approach -"ew"
If you download this free lesson, please rate it. Over 4,000 downloaded by TpT members! This is a great multisensory lesson for students developing reading and writing skills. The file is a PDF. A multisensory approach to phonogram development, "ew." Use of multisensory Orton Gillingham principles are incorporated to support student phonogram development necessary to become independent readers and writers. Techniques are based on research, and provide student with opportunities to engage numerous brain pathways to develop phonograms. 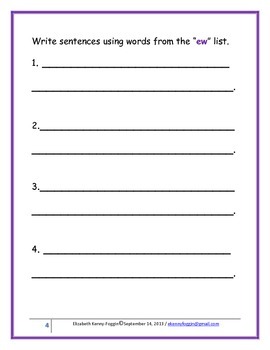 The packet includes: "ew" visual, word list, controlled reading, and writing activities to support "ew" skill development, word and sentence development. Looking for more of these great multisensory lessons that students would either enjoy or tolerate enough to complete? Go to my store link below and look at the variety of categories. Words, Phrases, Sentences - Reading Fluency Practice. NO PREP - Just Print and Go! Emergency OG Substitute Lesson Plans 1-4Emergency OG Substitute Lesson Plans 5-9Reading Fluency Word Lists; Phrases and Sentences! cle - Syllable Typeow diphthong and more! If you have any questions, please email me at ekennyfoggin@gmail.com .